Roy Leigh has been monitoring UK Little Owls for over 15 years in Cheshire, North West England. Roy recently launched his 'Little Owls and Orchards Project' - he works with orchards to help enhance biodiversity and nest sites for Little Owls, which favour this declining habitat in the UK. We will keep you posted about this exciting project as it develops. Roy wants to develop a methodology to age nestling Little Owls in the UK. He needs your help - can you help him? Examining down colouration and physical features is the most appropriate method to age nestling Little Owls which are less than 10 days old. 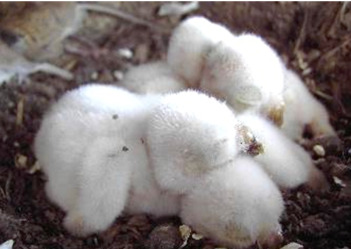 However, it is possible to age nestlings which 10 ‒ 30 days old by measuring their wing length. Presently, there is no formal or accepted measurement data for ageing nestling Little Owls in the UK. We aim to produce such data and needs your help with our pilot study. Nestling age is widely recorded in Belgium and the Netherlands as part of ongoing Little Owl nest monitoring programmes. Wing length data have been recorded in both wild and captive owls with a known egg hatch date. Measurements were recorded during several breeding seasons, allowing for seasonal variations in prey availability. 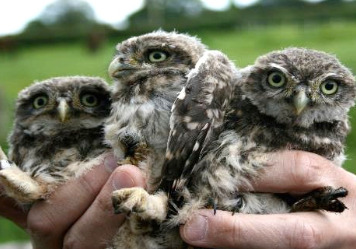 This has generated reference data for accurately ageing nestling Little Owls. The objective of our study is to field test the nestling ageing methodology used in Belgium and the Netherlands on UK Little Owls. We need the help of ringers and nest recorders and intend to run a pilot study for three years and then present our results to the British Trust for Ornithology in a peer-reviewed journal article. We would like to produce ageing data which is formally recognised and useful to nest recorders and the BTO. Nestling Little Owls - age 1-2 days old. 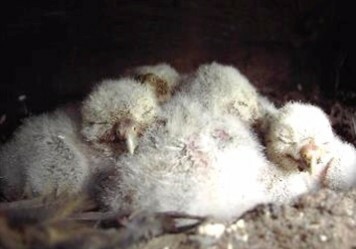 Nestling Little Owls - age 6-7 days old. These Little Owls are close to fledging.